I recently had the pleasure of sampling a series of wines from Sardinia, Italy. More specifically, the tasting focused on the wines of a coastal wine region that specializes in making a wine called Carignano del Sulcis. This region centers around the city (and island) of Sant’Antioco and features red and rose wines made from the black-skinned Carignano grape. The 9300 square mile island of Sardinia, Italy’s largest, is located approximately 150 miles off the country’s west coast in the Mediterranean Sea. Unlike in the rest of Italy where wine has been (and continues to be) an integral part of the local economy, as well as deeply engrained in the local culture for thousands of years, the Sardinian wine culture is much smaller and only goes back a few centuries. The majority of Sardinian best vineyards are located on the Island’s west coast where the cooling breezes of the Mediterranean helps moderate the otherwise hot conditions. The region of Carignano del Sulcis occupies the south-west corner of the island and encompasses 18 specified communes. Now, one would think that given the regions location (off the coast of Tuscany) the grape varieties grown here would include Sangiovese, Barbera or Trebbiano, right? Not even close. The vineyards here are planted with French and Spanish varieties including Grenache, Carignan and Cabernet Sauvignon – all of which love the islands warm and dry climate. As the name ‘Carignano del Sulcis’ indicates this week’s featured region is devoted to Carignano (Carignan); a grape that is believed to be native to northern Spain – most likely named after the town of Carinena. 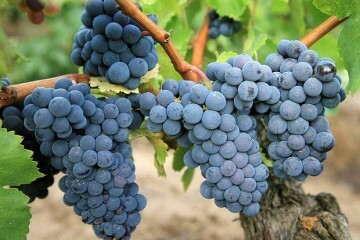 Both in Spain and in France the grape has traditionally been used as a blending grape – specifically for adding structural elements such as tannins and acid, not to mention color, to the wine. In its preferred climate however, places like southern Sardinia’s where it is warm and dry, the black-skinned variety can stand on its own. And in Sulcis it does. The Sardus Pater winery is located on the island of Saint’Antioco and is the home of some of the regions oldest Carignano bush vines – some of them more than 80 years old. Their 100% Carignano 2009 ‘Is Arenas’ Riserva is a big and delicious wine; a great representation of what this wine brings to the table and one that I think most Zinfandel and Cabernet Sauvignon drinkers will enjoy. It is rich and luscious brimming with dark berry fruits and raisons, but it still maintain its italian’ness (yes, I just made that word up). What I mean by that is a certain herbaceous element, almost like chewing on a handful of mixed dried rosemary and oregano. The finish is long and persistent – enhanced by dusty tannins and with just enough acidity to keep everything in balance. Steffen Rasch is a Certified Sommelier and Specialist of Wine. Feel free to email him at srasch@ProvidenceWineAcademy.com with any wine-related question or learn about wine in person by signing up for one of his tastings through the Providence Wine Academy.